Holidays is a period that lasts much shorter than academic term. That's why you, a student who have diligently worked hard the whole year must take the most from college break. It is completely behind the law to waste precious vacation time on watching movies or rewatching the series of "Friends". It's time to make something legendary, as Barney from "How did I met your mother" never gives up to say. It’s time to open yourself for adventures and fill your life unforgettable impressions! So, my dear friend, you must mark these words: nothing awesome happens in your comfort zone! To make your life more adventurous, you must travel somewhere far. The fact is that you have a chance to travel even to distant countries cheap. And this article will provide you information about ways how to travel on a minimum budget. Thousands of students all over the world have already visited dozens of countries, bet you can beat their records! Camping can be a great way to spend quality time both with family and friends. There are endless activities that you can participate in while camping. Things such as fishing, hunting, volleyball, swimming, or just a great cookout over a wood burning campfire can be some of the most fun camping activities for you to enjoy in your outdoors excursion. Camping activities can be diverse depending on personal preference and the activities that students love to do. Singing songs or playing simple games like Hide and Go Seek, swimming in pond and singing song in front of the campfire, eating fire roasted marshmallows, this is the atmosphere you have to experience for sure during your college break. Camping is an inexpensive way to spend a vacation with great fun. With very little investment, you can purchase nothing more than a tent, sleeping bag, food and hygienic supplies and go on a trip. You don’t have to pay for accommodation, don’t have to spend your savings on hotel services. Tourists usually spend more money on living costs than on transport. So, with camping supplies you can travel anywhere and save your budget for something noteworthy. Important: Packing thoroughly before starting your trip can make for a smooth, drama-free camping experience. You can choose several destinations for camping, but the primary idea of such travel is to get away from urban surroundings. In fact, with a tent and other camping supplies on your back, you can go anywhere. So, why not go to the mountains, or live several days in picturesque forests? You can explore lush flowering gardens and naturalized courtyard pond. And nights in the tent are so fascinating! Let your eyes adjust to the dark and enjoy seeing the natural world at night. During a camping trip to the mountains and lakes, you can explore all that mother nature has created. There’s nothing like a breath of fresh air, breaking out into the great outdoors and experiencing nature. Have no idea of where to go camping? Before your trip, look for lists of best campsites. Whatever the case, camping is an activity that depends on what you make it. If you can survive with the bare necessities then more power to you! If you need some of the comforts of home don’t be afraid to tote them along. A camera will produce evidence of all the lifelong memories that are made. The most important thing is to have fun and enjoy the time with the ones you love! There is only a tiny chance to find a person that have never watched Pirates of the Caribbean. There is a less chance to find the one who never dreamed to spend a vacation on the isles as a romantic pirate from the movies. Did you know that it is possible to find last minute Caribbean vacation packages and cut costs significantly? With packages, you get everything you need for your holiday in one deal so that you do not have to buy each thing separately which usually costs more. Last minute vacation specials will include voucher and coupons for activities on the island and it would be wise to check these out. What to do on the Caribbean Isles? Many of the islands have forts, historic buildings, government buildings, churches and more for you to explore. Some of these are even free to visitors; you just need to plan out your route to visit them. When you take a trip to the Caribbean, it gives you the opportunity to eat something different and out of the ordinary from what you are probably used to. There are new and different restaurants, local foods and more. One good trick to find great restaurants at a good price is to look for places with good crowds of more locals than tourists. Usually, these places will have lower prices than the places that cater to the tourists. Another way to experience the culture is with something called street food, which is found all over the islands of the Caribbean and they offer tourists delicious and exotic dishes for a low price. So, a good way to travel on a restricted budget is to search for last minute holiday packages. A cheap Mexico all-inclusive vacation can be the right choice for you, but first, you need to find them. You can get a luxurious vacation without paying for all the separate expenses. An all-inclusive package will typically include airfare, hotel accommodations, food, drinks and anything else you might need while you are there. Certain types of entertainment might also be included in the package. These packages make affordable student vacations to Mexico possible. Some of the most popular locations for beaches in Mexico include Acapulco, Cozumel, and Cancun. Cancun vacation packages are available when you want that special romantic getaway that you won’t find anywhere else. You can enjoy surfing, swimming or soaking up the sun on the beautiful sandy beaches. Anything you love about fun in the sun can be done on Mexico beaches as well. The Gulf of Mexico has some of the most beautiful waters around and if you get on to the beach, you can experience this firsthand. You can get you cheap Mexico vacation online and save a great deal of money without sacrificing the quality of your accommodation. Don’t mistake cheap vacations for low quality. In Mexico, you can get a lot more for your money and when you shop around for a special deal, it means even more. Mexico City has over 20 million people and great fun and entertainment for all. If you want to see the excitement and the culture of Mexico, this is one stop you may want to make. You can go horseback riding, visit the Mayan ruins, explore the cities, and take jeep tours and so much more. Learn about the culture or experience in firsthand. 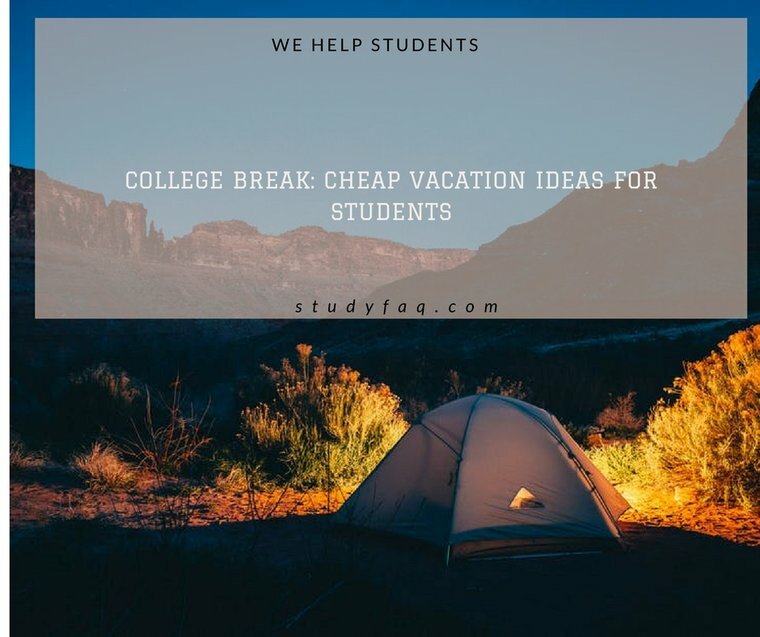 Now that you see the different cheap vacation ideas for students, you’re ready to get started. Even if you are looking last minute for your trip, you can find a deal that works for your needs and your budget. Always bear in mind that you can gather camping supplies, pay only for transport and travel wherever you wish! How to make your dorm room feel like home? How to earn money in college? How to celebrate Christmas in college? How to tell if eggs are good? How to tell if you have a fever and cure it? I have a lot of questions that need to be answered. While searching online, I found the site of StudyFAQ and it is all worth it. The tutor is very kind and I’ve got everything I needed. Thank you so much. Tutor did a great job. The process was very fast and efficient. I didn’t know that there is a quality and reliable tutoring service provider online. I can now start with my assignment. I was really having a hard time finding an expert who can help me with my topic. Thanks to StudyFAQ.com, I can start working on my assignment now.